Ed Konczeski (Tampa) helped organize a community garden as part of the summer camp put on by Action volunteers. By Chris Meehan and Sean Connolly. Photos: Sam Mertz and Laura Brummer. 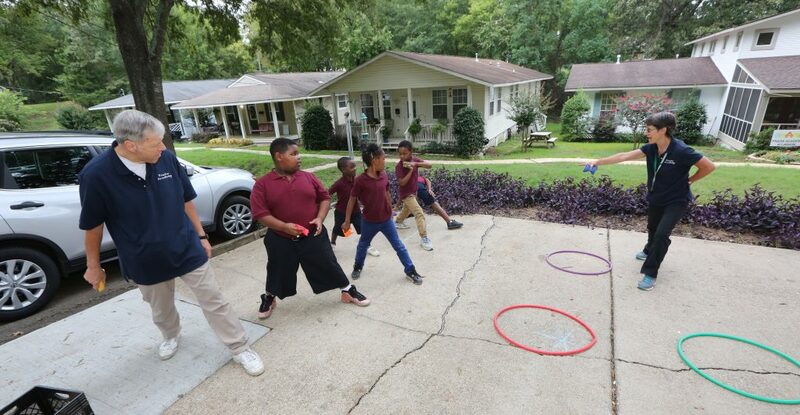 Action volunteers wrapped up another summer of work in Shreveport’s Allendale neighborhood on August 2. The volunteers left in their wake a trail of happy children, grateful neighbors, repaired homes and a community garden flush with growing fruits and vegetables. 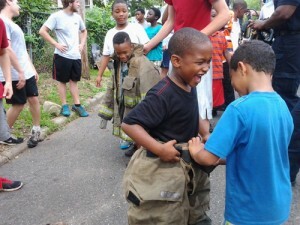 At a concluding barbecue, the children swarmed everywhere, playing football and jumping rope in the 98-degree heat. A few neighbors wandered down the block to check on the fruits and vegetables sprouting in the community garden. Gospel music blared from the speakers of a nearby car as girls performed a praise dance they had learned at summer camp. Nathan Barrett stood on a picnic table to address the group of neighbors, volunteers and Shreveport branch members, speaking of Pentecost and leading a prayer that God would pour out his Spirit on young and old alike. “This is my way to say thank you to all of you,” she told Patti. A boy tries on firefighting pants during a visit to camp made by Shreveport firefighters. In total, sixty-four volunteers served in Allendale this summer. They spent their mornings running a camp for children and in the afternoon tackled projects for neighbors and the Christians in Mission team. A staff of 13 (including seven college students) kept the volunteers fed, housed and organized, with a big assist from seven more high school student interns who served as camp leaders, prepared meals and kept records. Most days, more than 50 children came to camp, with an attendance high of 67, breaking last year’s record. The camp was organized into seven groups: three for boys, three for girls and a combined preschool group. Sam Mertz (South Bend) oversaw the boys’ groups. A chalkboard sign posted near the boys’ gathering place listed rules (among them: No Fighting) along with the consequence for using foul language—five push ups. The sign bore the boys’ signatures, indicating their acceptance of the terms. Colleen Murray oversaw the girls’ groups. She says one highlight came when a local grandmother proudly sang a version of the Lord’s Prayer that her granddaughters had taught her after learning it at camp. 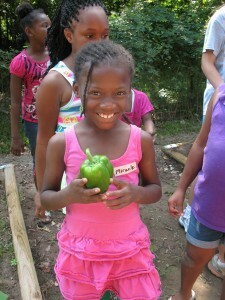 A girl shows off a green pepper that grew in the community garden. The community garden was the brainchild of retiree Ed Konczeski (Tampa), a lifelong gardener with experience growing plants in clay soil. He planned the garden in the spring, working with Ben Reinhardt to collect landscape timbers (needed for raised beds) and 600 feet of pipe and other components for an irrigation system. The Tampa branch covered the costs of seeds, starter plants and supplies. A former neighbor offered his empty lot as the site for the garden and a Shreveport dentist loaned his rototiller. Joe Bulger (South Bend) supervised the work crews who sweated through the afternoons. “We worked on five repair projects for our neighbors. We installed sheetrock on a ceiling, did some interior and exterior painting, built a retaining wall, rebuilt a front porch and repaired a wheelchair ramp,” he says. LOVED every single one of those stories. What a blessing to Allendale to have so many Spirit-filled people in it. Enjoying the fruit of our labors in more than one way! Glory to God! It sounds like the Allendale Camp is a blessing to everyone there. 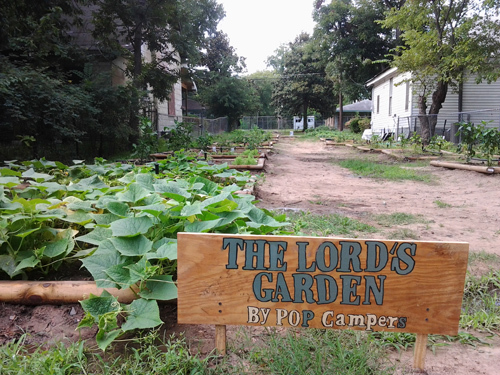 Their garden is such a great metaphor for how the love of the Lord seems to be ever-growing there in Shreveport! Thank you to everyone for your wonderful work. Thank you Lord for planting us in Allendale. It's clear our POP presence brought more of the Lord's glory to shine in Shreveport and touched myriad lives in countless ways. Such a blessing to hear about this! Kudos to you, brothers and sisters who toiled fruitfully for Him! May His Name be praised! All the stories of our presence in Allendale is so faith-building. What marvels the Lord is doing in our midst as young and old alike do their part to build the kingdom. Thanks to all who have given of their time and their hearts to serve God's people. It's great to see the names of you that I recognize from Buffalo Camp and from working with you in earlier years in Allendale. You are all making a great impact in the building of His Kingdom and making a difference in the world. Your sacrifice of work is encouraging to all of us. Keep telling your stories to all who will listen of the great things that God is doing. It brings tears of joy to my eyes to see how our Father's light is growing brighter and stronger each day, each summer, each year. Glory to our Lord and all of POP for the wonderful work that is going on. Thank you and may HE continue to be G L O R I F I E D! God is awesome! Looking forward to what He will do next! What a work! Such vision! So many of my brothers and sisters dedicated to empower others in the Spirit! Thank You for your presence in this work, and your gift of time.! I'm overwhelmed with gratitude for all the work that everyone has done. You have brought Christ's presence to Allendale. That must be why the children's eyes shine the way they do! Glory! I am struck by work we are doing together, particularly in how we are bringing the truth that "There is a new way to live in Christ". Teaching the children at camp how to forgive and get along will have impact for generations to come. Awesome!! Thankyou for loving God's children!! Thank you Lord for building Your kingdom in Allendale in 2013 , in the lives of your people : Campers , Cooks , Gardeners , CIM Family , Shreveport branch , the Kids , their Families , the Action Youth , the Branches in support and Publications - Your Kingdom is real , is here , is seen , is shared , Glory to You Lord ! Wow, great story....love the garden! Yea God!! Though many parts we are all one body; working together to build His Kingdom & for His glory!! Praise God for a successful camp! Thanks for all the sweat equity in doing construction. So glad the garden is flourishing! Thanks for all the hard work making it all possible! Its taken me a little while to get to reading this - What A True Blessing for all us and what a way to honor the Lord! Thank you for all of your wonderful service. Thank you brothers and sisters for your awesome love.